Over the summer the UCMP USGS rehouse project explored California's Franciscan assemblage and Great Valley sequence, not in the field, but through the exquisite collections made by USGS scientists. 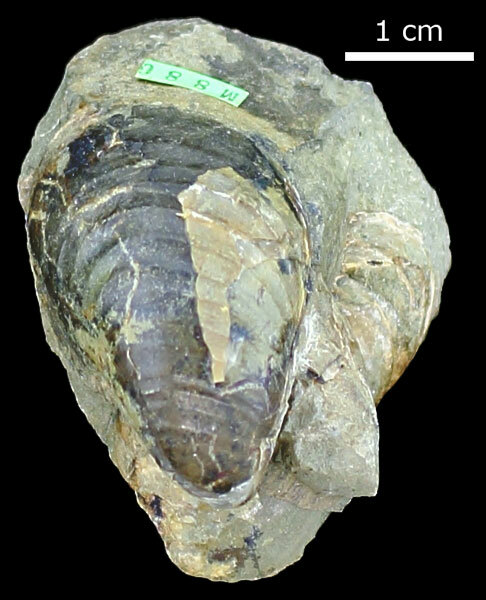 This continuing work is part of a UCMP two-year NSF grant to rehouse, catalog and digitally image 100,000 specimens from the former USGS Menlo Park invertebrate collection, now at UCMP. 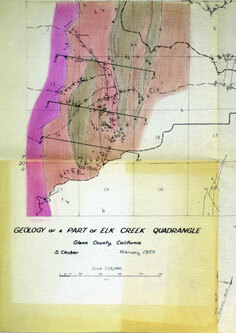 Left: 1958 draft geologic map of the Elk Creek Quadrangle, Glenn Co., CA, by Stewart Chuber. Right: Buchia sp. collected by Chuber from USGS Mesozoic locality M880, Glenn Co.
UCMP grad students Renske Kirchholtes and Jenna Judge compiled locality data from multiple spreadsheets, doubling the number of Mesozoic localities ready to be added to the UCMP online database. Geologic ages were assigned to these 3,000 localities based on the geologic formation, identified fossils or the locality placement geologic maps. We discovered excellent online resources for topographic and geologic maps called TopoView and MapView. These programs allow you to search/view any USGS quadrangle map, or search geologic maps by zip code or latitude and longitude coordinates. We use TopoView to fill in missing county names or check for the proper spelling of places in the locality description. With MapView, we can assign probable ages to localities based on where the fossils were collected. While searching drawers of fossils for age information, we discovered a large collection of hand-drawn geologic maps of the Elk Creek-Fruto area near Chico, CA, completed by Stewart Chuber in 1961 as part of his Ph.D. dissertation at Stanford. This is a great example of the primary purpose of the Menlo Park collection — using fossils to map and assign ages to geologic units. The project has added nearly 7,000 localities to the UCMP database and linked 1,000 photos to these records so stay tuned for more updates!